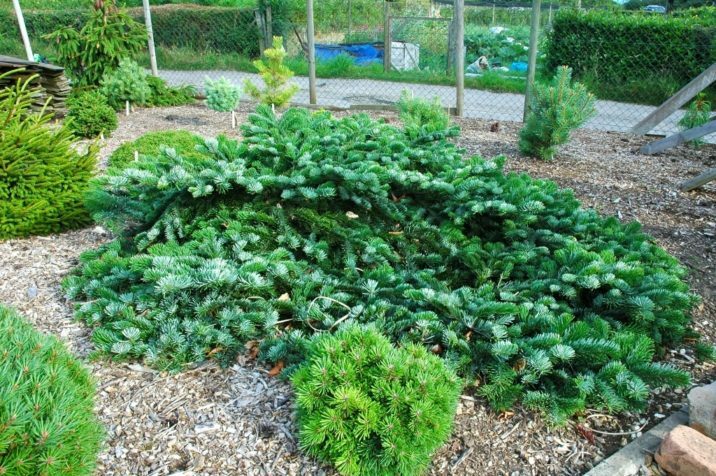 Abies amabilis 'Spreading Star' is an old selection of Pacific Silver fir from The Netherlands which has very attractive lush, green, fluffy, long needles with silvery undersides and a tendency to grow very wide without developing any sort of leader. After ten years, a mature specimen will be an attractive low spreading mound with overlapping horizontal or arching branches, measuring about 3 feet (1 m) wide and 1 foot (30 cm) tall, suggesting a yearly growth rate of 3 to 4 inches (7.5 - 10 cm). 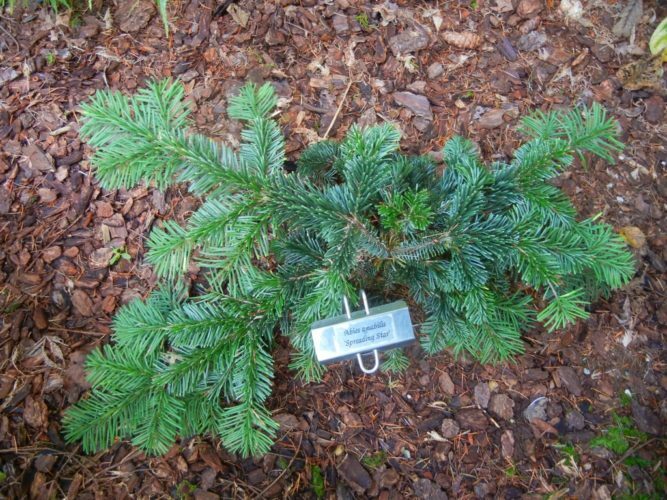 This cultivar originated as a seedling selected before 1960 by Blijdenstein Pinetum, The Netherlands. This plant was also seen listed as Abies amabilis 'Procumbens' at the Herm Hesse nursery. Clearly, the original name took precedence. Attribution from: Fincham, Robert L. - Coenosium Gardens Catalog of Rare Plants For The Discriminating Person ; Catalog Number Fourteen, January 2003. A nice young specimen of Abies amabilis 'Spreading Star' taken at Hobbiton Gardens in Port Orchard, Washington. This picture shows the "hardened-off," mature needles. This specimen is about five years old. 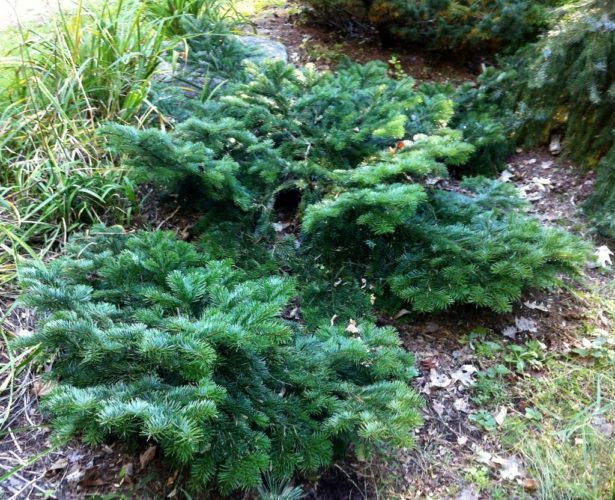 Abies amabilis 'Spreading Star', fall 2013, Alton, NH. Abies amabilis 'Spreading Star' — a magnificent older specimen. 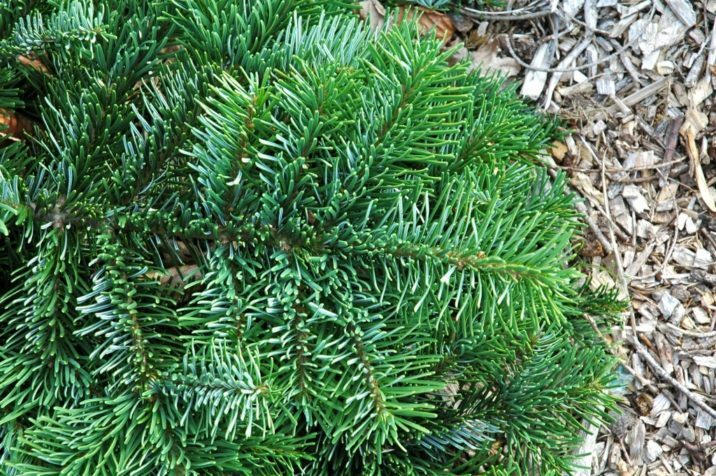 Abies amabilis 'Spreading Star' — a closeup of foliage detail.